Amazon accounts for 43% of US online retail sales. The one sector of the retail market Amazon didn’t have a significant toe-hold in was the gigantic $800 billion a year grocery market. That is until now. Whole Foods now belongs to Amazon – 431 strategically located stores and 91,000 employees. All of which will align with their new parent company, helping them support their expansion into the grocery market. If we look at the stock market, its reaction reflects a lost battle for all other retailers, with the acquisition wiping off $22 billion in market value from rival supermarkets. Target, Kroger, Costco, Walmart, Dollar General, SuperValu and Sprouts lost 6 percent of their total worth in one day. Press headlines have focused on the rivalry between Amazon and Walmart, a battle in which the online giant expands its physical presence while the leading retail chain goes on a tech and ecommerce acquisition rampage to fight back. 62% of US households have an Amazon Prime membership, while Walmart has stores within 10 miles of 90% of American shoppers. While it’s true that they’re both figuring out the right balance between online and offline retail, this acquisition will have a deep impact on the entire retail landscape. As USA Today puts it, this deal will “change the way you buy food forever”. What does it mean for the retail industry? In one word, it means pressure. 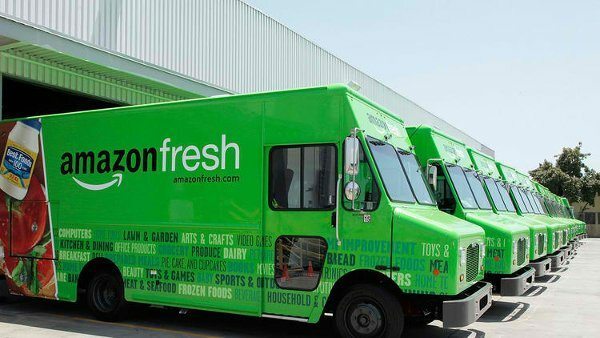 Profit margins are traditionally razor-thin for grocery chains and Amazon will have a greater ability to squeeze margins throughout the supply chain even further. They’re determined to gain market share and increase revenues across many verticals, plus they have the muscle to absorb overheads associated with deliveries by focusing on growing revenues and sales. Last year alone, they ‘lost’ $7bn on shipping. Delivering 1.6 million boxes daily on people’s doorstep in record time isn’t easy nor cheap – but putting customer service and convenience at the heart of everything they do is clearly paying off. Amazon has introduced a new level of value, convenience, ease and efficiency to product categories including books, electronics, and household items. Their sheer volume of sales (plus other very profitable business like Amazon Web Services) puts them in a prime position to keep expanding their empire far and wide. If you think about it, there is no industry which they couldn’t delve into – what if they bought a fuel company to power their fleets? Or global chain like 7-Eleven to add 50,000 locations to their distribution network? An airline? But the paradigm shift lies in their customer service. Amazon has proved that having superb customer service, plus the logistics infrastructure to make it happen, is just as important as the products themselves. This acquisition will push the industry to an entirely new level of service, where delivery speed, visibility, convenience, and transparency throughout the supply chain all become mandatory. However, this is a battle that doesn’t only apply to supermarkets. Every retailer, from restaurants to fashion, is facing the same challenges and are well aware that they have to streamline their logistics infrastructure to create a more agile supply chain – which is as much about customer insights and real-time visibility, as it is about speed and convenience. Retailers will have to move fast, and they can’t rely on their current logistics tools and infrastructure to evolve. They must embrace new technologies, tools and platforms to transition at lightning speed if they want to match Amazon’s logistics capabilities. For a customer, the end choice and result comes down to value and convenience – but behind the attractive prices and speedy service that Amazon provides, lies an exceptional infrastructure which they’ve built and perfected over the past decade. Retailers must review their logistics infrastructure – from the first mile to the last. The agility and visibility throughout the supply chain is no longer a differentiator to win new customers, but an expected baseline to retain your existing ones. The last mile in particular, it’s a sticking issue that retailers will have to embrace and perfect – thinking less about it like a nice ‘expensive addition’ to delight customers, and more like an integral part of the purchasing experience. In a similar way in which nobody would question that there’s a cost attached to renting property for brick and mortar retail, there is a cost attached to running and streamlining the delivery logistics for online purchases. They’re both valuable and necessary. No business, regardless of how big or small has everything figured out. The landscape constantly changes and physical retail and ecommerce will have to strike the right balance to serve customers. What is certain, is that logistics will play a leading role in the future of any business. Amazon is using their deep pockets to invest and innovate in their infrastructure and distribution network – from a cargo airline to self-driving cars and drones. On the other hand, retail chains have an institutional knowledge, well-known brands, and expertise that shouldn’t be underestimated. They just need to act fast and decisively – so with the help of technology, logistics, and distribution partners they can ensure their businesses flourish in this a landscape in which delivery logistics, transparency, and convenience have taken center stage.